www.MyInstantOffer.com - Lending Club Pre-Approved Personal Loan - Deal Biscuit - Eat The Info! Personal loans are a hot new products being offered by banks and lenders as they appeal to such a huge audience. These loans are designed to cover a gap in finances for short term, and generally smaller amount (less than $50K is a typical high end for a personal loan). With so many offers out there, many customers are wondering whether their personal loan offer is legit. Lending Club personal loans are absolutely legit. Lending Club is one of the pioneers in personal loans and have revolutionized the industry with their peer to peer lending. Lending Club is accredited with the BBB and hundreds of thousands of loans have been issued through their service. Where Can Customers Find a MyInstantOffer Code? These codes are provided to select consumers. Only people who have received an offer with a code will be able to make use of the My Instant Offer Website. Your offer will be laid out as shown below. The code is highlighted and is a alpha numeric code. This is the information that is provided on the MyInstantOffer webpage. Other customers who are still interested in a personal loan with Lending Club can absolutely still apply. They will use a different website but many of the features are still the same. Customers can get a free quote that does not impact their credit score. Customers can apply for up to $40,000. If you are looking to apply with Lending Club and do not have an offer you can visit their personal loan homepage. Whats the Lending Club Pre-Approved Loan deal? Lending Club is a peer-to-peer lending company that was founded in 2006. The idea behind the company is regular everyday people are lending their money to regular everyday people. They are registered with the Securities and Exchange Commission (SEC) and are based out of San Francisco CA. This peer-to-peer lender was first started as a Facebook’s app. Today they have grown to a multi million dollar company and have provided billions of dollars in loan funding (these numbers alone speak for their prevalence in the lending space). The Lending Club has been named as one of Forbes most promising companies and has been features in the New York Times and many other newspapers across the country. Lending Club works by connecting borrowers and investors. People who need money will take out a loan based on investors who provide the funds. As the borrower repays their loan, the investors are able to make money on the interest that is charged. This revolutionary lending method eliminates the bank and has provided many lending Club customers access to the funds they need. 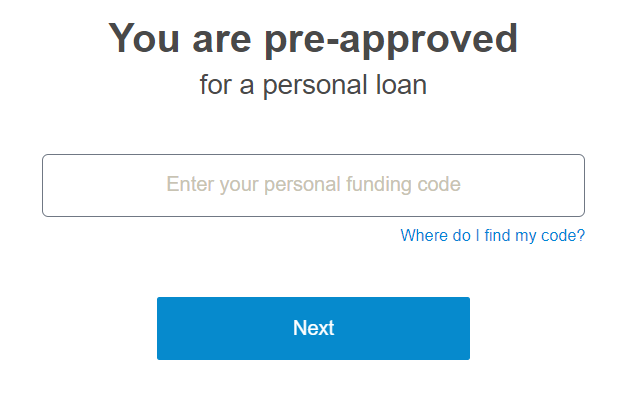 Lending Club Personal Loan – Is it Legit? With so many money options out there it is common for people to be concerned with running in to scams or other sources that are not legit lending options. Rest assured, Lending Club is not one of these types of companies. As mentioned earlier, Lending Club is fully accredited and millions of loans have been processed. If you are interested in finding out how they work, you can even learn more about investing with Lending Club. Pay day loan companies are one of the big reason people worry about loans products. It is important to note that the personal loans provided by Lending Club (My Instant Offer) and other similar services, are nothing like the high interest pay day loans which are often predatory in nature. Pay day loans charge ridiculous fees and are anything but straightforward. With The My Instant Offer Personal Loan you will have your terms clearly provided before you commit to the loan. Deciding on a personal loan requires consumers to weigh their options. One of the most common reasons people get a personal loan is to pay off high interest credit card debt. When you calculate the pros and cons of a personal loan you should compare the total costs. For instance, if you are paying off credit card debt, you can easily calculate the savings when comparing the two options. Typically personal loans will have much lower interest rate than credit card debt. Another benefit of paying off a high balance on your credit card is that you may see a boost in your credit score as you eliminate some of the high risk revolving debt. Other common reasons people apply for a personal loan include emergencies. If you need fast cash, a personal loan is definitely a smart option because the funds are available so quickly. The MyInstantOffer with Lending Club provides a personal loan that doesn’t charge fees for early payments. If you are in a circumstance where you need to take out a personal loan, you should definitely make sure you find an option without high cost penalties. 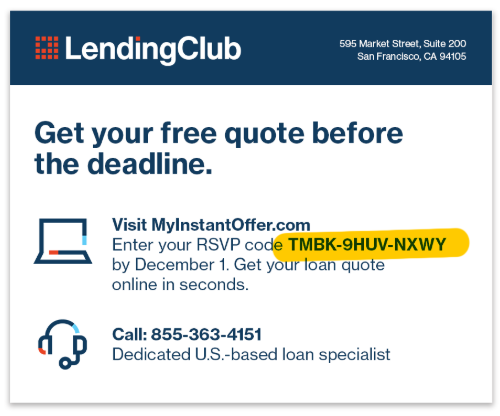 Lending Club My Instant Offer does not charge origination fees or early payment penalties making it a very competitive option.